JBC Tools NP105-B Steady Nano Tweezers. 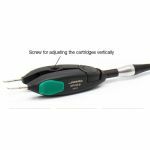 The JBC smallest tweezers for repairing very small-sized components requiring the greatest precision such as chips 0402, 0201, 01005, etc. Purchase JBC Tools NP105-B Steady Nano Tweezers sold by Howard Electronics Today!